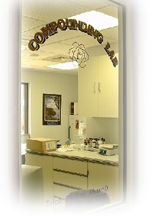 Welcome to the Custom Compounding Center! The Custom Compounding Center is located inside Bolivar Drug (formerly operating as The Medicine Shoppe pharmacy) in Bolivar, Missouri. As a compounding pharmacy, we are able to prepare medications to meet unique physician and patient needs. We use only pharmaceutical grade chemicals and are members of the Professional Compounding Centers of America. We are able to make any customized dosage forms such as gummy treats, troches, lollipops, transdermal gels, and suppositories. We are also able to customize medicine strengths and dosages that can be dye-free, sugar-free, and preservative-free.